Disney has finally woken up to the massive demand for Star Wars experiences, and is massively expanding the Star Wars presence in their theme park universe. It's going to be exponentially bigger than just one measly Star Tours ride. According to Entertainment Weekly Disney Chairman and CEO Bob Iger revealed to investors that "[Disney's] also developing ideas and designs for a far greater Star Wars presence in our parks... We expect to provide details about this sometime next year." And when he was asked whether this would compare to Universal's Potter franchise he confirmed that it was going to be "is going to be just that." Our bet? If they want to make a big to do of the announcement of the park, maybe they'll reveal ride specifics and concept art at Star Wars Celebrations or at the D23 convention. 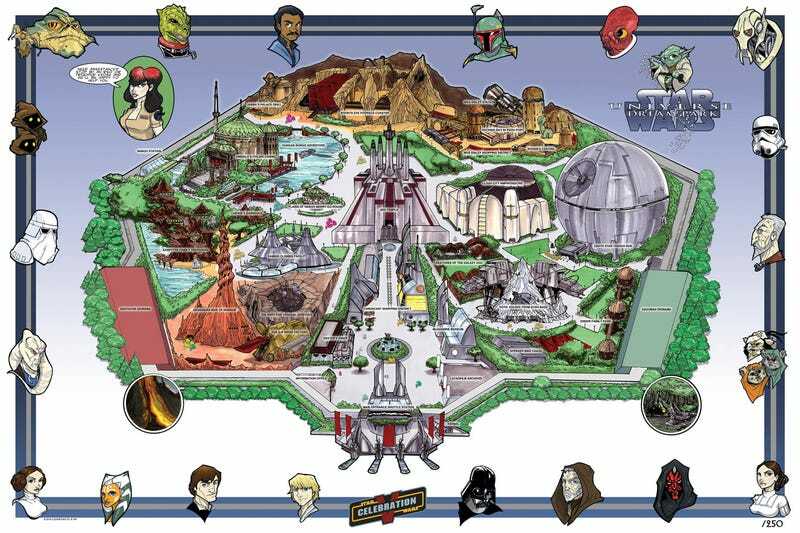 In a perfect world, they would use the theme park dreamed up by artist Tom Hodges. Because he really had some fantastic ideas.